A fragment of a cast copper alloy vessel of medieval date. The fragment is part of the leg of a probable cooking vessel. The leg is roughly triangular in section with a raised central spine extending along the front. The reverse of the leg is concaved and undecorated. The breaks at both ends of the leg fragment are very worn. The metal is a mid brownish-green colour and is worn. The fragment is 73.8mm long, 27.8mm wide, 6.8mm thick and weighs 96g. 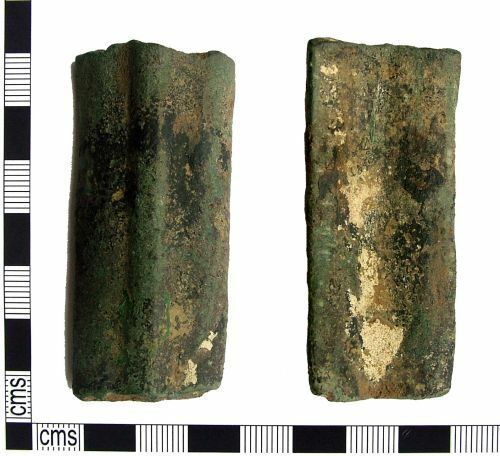 While it is not possible to allocate this fragment to a specific type a mid 13th to 16th century date is generally accepted for copper alloy cooking vessels.